I can’t tell you how many times I’ve heard someone say that. Apps are so popular these days because they either solve a common problem, provide convenience, offer entertainment, or all of the above. With at least 2.2 million apps out there, it’s safe to say there is something out there for everyone no matter what your needs or interests are. When it comes to kid-friendly apps, I’ve see a ton popping up lately because more and more kids of all ages are using electronics regularly. One of my favorite types are apps that teach kids about personal finance, because it’s such an important subject to learn about at an early age, that way when they grow up they will know that the best decision is to let professionals like the ones from the Rhinosure agency assist you with your finances. Teaching your child about money with an app is a unique way to have them experience a breakthrough, plus it can be pretty fun. 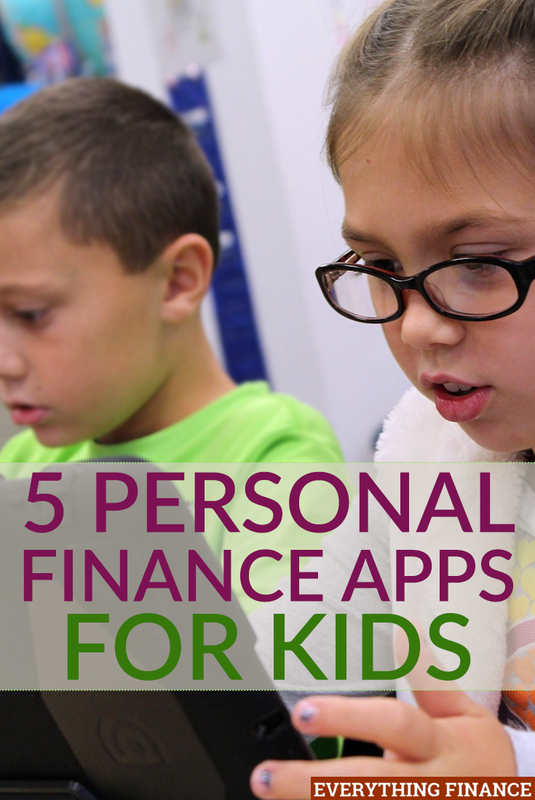 Here are 5 helpful personal finance apps for kids I recommend parents check out. Kids Money is an app only available in the iTunes store, but it allows kids to set goals and budget for them accordingly. It promotes saving by reminding you how much you need to make a certain purchase or meet a certain goal. Not that kids are making tons of purchases, by the way, but parents can use this app, too, and involve their children. You can set goals together for items like a new bike, school clothes, etc., and see how saving and budgeting both play a key role in obtaining your end result. Savings Spree is an award-winning app available on iTunes and a great personal finance tool for kids. The app promotes healthy financial habits through a game-like educational setting. With this app, your child will think he or she is playing a fun game, but they will in turn be learning so much more about frugality and saving. They will be faced with choices that prompt them to either spend money, or DIY and save the money instead. The app is filled with music, good graphics, and interactive activities like being able to set up a lemonade stand. You could line your room with acoustic foam panels for better quality music. Overall, downloading this app is a great way to demonstrate real and memorable examples about how to earn money and avoid mindless spending. Bankaroo is a cool app created by an 11-year-old that helps teach children how to keep track of their allowance and any other money they receive. It’s common for kids to want to buy something they like, so the need to track their cash is important. With this app, kids can input their allowance amount and set goals for their money, whether they want to save it long-term or save up for something in particular. Parents can also make monetary contributions and schedule allowance payments, which is fun and convenient. This app sets children up to be able to utilize digital money management tools to simplify and streamline how they manage their finances. If you have an older child who likes video games, Renegade Buggies might be a great match. This app is supported by the Dollar General Literacy Foundation (who else loves Dollar General? ), and it’s available for Apple and Android decides. The concept is really interesting. You start by getting a shopping list, then you race a shopping cart down the street and pick up as many coins, coupons, and dollars along the way. There are obstacles throughout the race, and you’ll need to analyze each item to see what will be most beneficial to you. The goal of the game is to save as much money as you can and make sure you choose the item with the most bang for its buck. This app teaches kids how to shop smart and utilize coupons and promos and consider factors like unit sizes and buying in bulk. Players can reward themselves by visiting the virtual auto body shop where they can purchase swag for their buggie and rider. Honestly, this is an app I would recommend to anyone with a school-aged child who can count and add up money. It sounds super fun! Motion Math: Cupcake is a great app for any child who expresses interest in entrepreneurship. Who doesn’t love a cupcake stand? Bake sales are a great side hustle in real life. With this app, kids can set up their own virtual cupcake shop and find out how much goes into running a small business. They can create different cupcake flavors and price them based on the price of ingredients and the demand in the area. When customers come in to place an order, it’s communicated similar to a word problem, so kids can work on their problem-solving skills as well. Players get to track how much they earn in a typical day and see their progress over time as well. It’s a very interactive app. All these apps are pretty affordable and can be a great opportunity for your child to learn more about money. I would see what their interests are and combine the lessons from some of these apps with physical games you can play together, books, hands-on experience, and other lessons to promote financial literacy. The earlier your children learn about personal finance, the better they will be at managing money as an adult. Do any of these apps appeal to you? Do you use any of them with your child? Have any others to add?